In the end, the Red Sox apparently decided to spend more than $100 million to get the Japanese pitcher Daisuke Matsuzaka in a Boston uniform for the next six seasons, a daring financial outlay for an athlete who has never thrown a pitch in the major leagues or sampled the mildly insane rivalry between the Red Sox and Yankees. For intrigued baseball fans in the United States, Matsuzaka's relevant statistics are no-brainers: 26 years old, 6 feet, 187 pounds and a 108-60 record with a 2.95 earned run average in eight seasons with the Seibu Lions. But what many fans, the Red Sox front office and even Matsuzaka's determined agent, Scott Boras, may not realize is that in the eyes of the Japanese, Matsuzaka's most revealing statistic might be his blood type, which is Type O. By Japanese standards, that makes Matsuzaka a warrior and thus someone quite capable of striking out Alex Rodriguez, or perhaps Derek Jeter, with the bases loaded next summer. Japanese popular culture has been saturated by blood typology for decades. Dating services use it to make matches. Employers use it to evaluate job applicants. Blood-type products -- everything from soft drinks to chewing gum to condoms -- have been found all over Japan. ....A person can have one of four blood types, A, B, AB or O, and while the most common blood type in Japan is Type A, many of the more prominent Japanese players are like Matsuzaka, Type O. That group includes Hideki Matsui of the Yankees, Kazuo Matsui of the Colorado Rockies ... and Tadahito Iguchi of the Chicago White Sox. 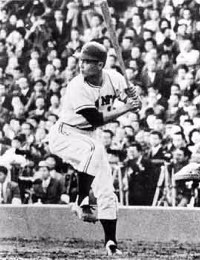 Sadaharu Oh (pictured), the great Japanese home run hitter? He is type O, too, as is Kei Igawa, the 27-year-old Hanshin Tiger left-hander who has until Dec. 28 to sign with the Yankees. In Japan, people with Type O are commonly referred to as warriors because they are said to be self-confident, outgoing, goal-oriented and passionate. According to Masahiko Nomi, a Japanese journalist who helped popularize blood typology with a best-selling book in 1971, people with Type O make the best bankers, politicians and -- if you are not yet convinced -- professional baseball players. But there are exceptions to any categorization, and in this instance one of them would appear to be Ichiro Suzuki of the Mariners, who has become one of the great hitters in major league baseball since joining ... Seattle in 2001. Suzuki is Type B. "That makes sense in a way," said Jennifer Robertson, a professor of anthropology at the University of Michigan who specializes in Japanese culture and history. Robertson added that people with Type B, known as hunters, are said to be highly independent and creative. And creative would be a good adjective to describe Suzuki at the plate, where he sprays the ball to all fields and sometimes seems to hit the ball to an exact spot. Suzuki set the major league record for hits in a season with 262 in 2004. ....In a sense, all this will play out when Matsuzaka faces Hideki Matsui for the first time next season. In Boston and New York, it will be Red Sox pitcher versus Yankee hitter, right-hander versus left-hander, high-priced Japanese athlete versus high-priced Japanese athlete. In Japan, it will be all that and more. May the best Type O prevail. In no "sport," wrote the editor of Sporting News, is "vicious and vile objurgation" of a performer permitted as in baseball. Jibes like "You bum, you're all in" and "You're a has-been, you ought to be shining shoes or sweeping the streets" were mild compared with the profanities and obscenities frequently directed at players. A bank executive, complaining of these conditions, said that he would attend many more games if he did not have to listen to the epithets hurled at players. A traveling man who said he found conditions the same in all the ball parks objected particularly to such language being used in the presence of ladies. Jack Fournier threatened to quit baseball because of the harassment of Brooklyn fans who persisted in vilifying him with "ugly epithets." His wife had already stopped attending the games because she could not stand the language directed at him. Every so often an angry player climbed into the stands and attacked a heckler. Rube Waddell beat up one in 1903 .... Sherwood Magee knocked out a drunk who, after abusing him from the bleachers, followed him to the clubhouse to continue his insults. Once Nashville police escorted Detroit manager Ed Barrow to jail for throwing a bucket of water over jeering fans during an exhibition game. More serious repercussions resulted early in 1912 when Ty Cobb(pictured) leaped into the stands in Hilltop Park, New York, and assaulted a spectator who had been heckling him. The umpires put Cobb out of the game, and Ban Johnson suspended him indefinitely, pending an investigation. The depth of player resentment of spectator abuse is indicated by the fact that, despite Cobb's unpopularity among them, all eighteen players on the Detroit team opposed Johnson's action .... [T]he players wired Johnson that they would not play another game unless he reinstated Cobb. "If players cannot have protection," they stated, "we must protect outselves." Johnson rejected their demands, declaring they had no business taking the law into their own hands and that a player had only to appeal to the umpire in order to have ruffians ejected from the park. Consequently, the Detroit players carried out a sympathy strike by refusing to play the next day in Philadelphia. Even a hero of Christy Mathewson's stature once overstepped the bounds in his relations with fans. The incident occurred at Philadelphia in 1905. It started with a fight between a New York and a Philly player. Others joined in, and during the fracas Mathewson punched a lemonade boy passing in front of the Giants' bench, supposedly for making a remark about a New York player. This "brutal blow," as a Philadelphia writer called it ... split the boy's lip and loosened some of his teeth. After the game several thousand people mobbed the Giants in their carriages and pelted them with stones and other missiles before the police could quell the mob. fact, so lauded were his virtues that there was danger of his being considered a prig, so assurances were given that he was also human enough to take a drink, play poker, and even utter an oath on occasion. I was born on a farm between two small towns called Bradingberg and Ekron, about fifty miles from Louisville .... But I loved off the farm at age seven. It was 1925, and at the time farming was difficult. We grew tobacco, some corn, just something to survive on. We were very poor, five children, trying to make a living on not too good of a farm. When we moved to Louisville, my dad did odd jobs .... Course, my dad had no education. Of the children, I was the only one graduated from high school. There was not a lot of education in my family. It was the early '30s, the Depression years .... We all worked. I worked selling box lunches, and I delivered papers .... When I got out of high school in 1936, jobs were tough to get, and I worked in a furniture company and Mengel Box Company, making twenty-five cents an hour, and you worked ten hours a day, which added up to $2.50. And then I went to work for the telephone company, and I got a big raise to $18 a week. I was an apprentice cable splicer. I had only layed five games my senior year in high school. I was not large enough. Hell, when I graduated, I was about five foot four and weighed 120 pounds. I played ball for my church team, the New Covenant Presbyterian Church, and we won the city championship in 1937, and we won a trip to the 1937 World Series. A man by the name of Captain Neal, who was the general manager of the Louisville Colonels, which was a Double-A ball team, evidently noticed me, and he asked meif I wanted to play professional ball. And I was fortunate it wasn't a good club. It was independently owned, so consequently we didn't have too many good players, so I got to stay with the team and play. So sometimes it helps to be in the right place at the right time. Frank McKinney, and we had a working agreement with the Boston Red Sox. 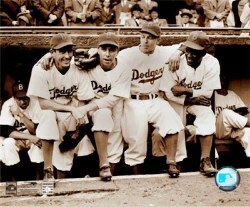 In '39 they brought up players from the Red Sox, so we ended up that year with a pretty good ballclub. In fact, we ended up winning the Little World Series. And at this point I thought I was going directly to the Red Sox. No question. Bobby Doerr, the Red Sox second baseman, told me he was looking forward to it. Joe Cronin was the manager and the shortstop and getting older, and Bobby figured I would be there. .... But evidently Mr. Cronin thought he could play a few more years, and he talked them out of buying me, and Bush and McKinney sold me to the Brooklyn Dodgers in 1939 for $75,000. he probably wanted someone to take his place. But I got hit in the head by Jake Mooty of the Cubs, and I was in the hospital for eighteen days .... And then after I came back, in August I slid into second base and broke a bone in my ankle, so I was out for the rest of the year. So I only played eighty-four games my first year. pressuring Leo to take me out, and he did for one game. But Leo hadn't played n a while, and it was tough on him. Leo had a little trouble with a fly ball going back over his head, and he decided he better put me back in the line. 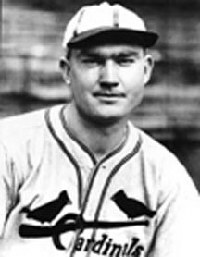 and in 1940 Mize set a Cardinal team record for home runs with 43. That year Mize might have had a chance to break Babe Ruth's season record of 60 home runs, but a temporary wire mesh fence was erected above the low right-field wall, and many of the 31 doubles and 13 triples he hit banged off the screen instead of going into the stands for home runs. In 1942 his 137 RBIs led the league, and after he spent three years in the Navy, he hit 51 home runs for the Giants in 1947, becoming only the second left-handed batter in baseball history to hit more than 50 home runs in a season. That year his 138 runs batted in also led the league. He hit 40 home runs to lead the league in 1948, and his 125 RBIs made it the eighth season that he batted in over 100 runs. 1949 season. Mize played first base for manager Stengel and during his five-year Yankee stay, he became Stengel's number one pinch hitter, leading the league in pinch hits in 1951, '52, and '53. When Mize finally retired at the end of the '53 season, he had hit more home runs than any other active player. His 359 career home runs placed him sixth on the all-time home-run list behind an exclusive group of Hall-of-Famers: Babe Ruth (714), Jimmy Fox (534), Mel Ott (511), Lou Gehrig (493), and Joe DiMaggio, two ahead at 361. Behind Mize were two more Hall-of-Famers, Ted Williams, at 337 the only active player close to him, and Hank Greenberg (331). Giants in the annual Major's Trophy game for charity, and Stengel, knowing that Mize was not playing regularly, approached him before the game. "How you doing?" Stengel asked the big first-baseman. "I'm not playing much," Mize responded. "Over here you'd be playing," Stengel said. Stengel then urged George Weiss to acquire him. Mize had a .324 lifetime batting average, he had been a league All-Star for nine years, and he would be a perfect batsman to challenge Yankee Stadium's short right-field porch. For the Yankees there were also disturbing rumors that the Red Sox were trying to get him. In 1947, Mize became the only player ever to hit more than 50 home runs while striking out less than 50 times.